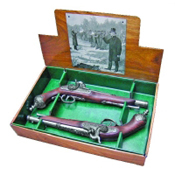 Colonial Historic Boxed sets, Historic Revolutionary War collectible boxed sets that include George Washington historic boxed knife set, Thomas Jefferson Historic boxed knife set, Historic boxed set dueling pistols, Historic boxed set English percussion dueling pistols, Historic boxed display sets colonial, collectible colonial Historic boxed sets. 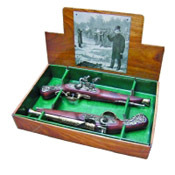 George Washington Knife Set. This handsome folding pocket knife features a 3 stainless steel blade, an eagle embossed on the handle with a picture of our 1st President. 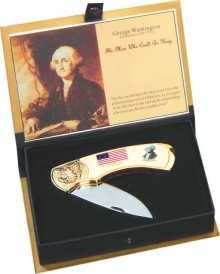 Knife is custom mounted in a deluxe book style box with the presidential seal on the front. Overall Length: 7 . 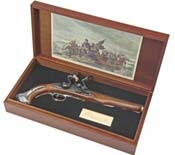 English Flintlock Pistol Dueling Boxed Set - Replica English Flintlock Pistol Dueling Boxed Set: Circa early 1700’s with Engraved lock and simulated brass barrel and simulated wood stock. 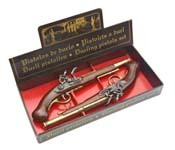 (2 FLINTLOCKS) Features Length: 15”, Weight: 1.4 lb.